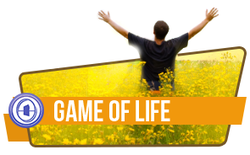 ﻿This course enables you to transform into a successful player of the game of life. This 3-day (21 hour) course has been created based on real-life success cases and gives an opportunity to remove specific limiting beliefs and instill hundreds of feelings to achieve greater success in life and business. This is an amazing practitioner seminar that utilized the ThetaHealing Technique. This seminar was written in collaboration with Vianna Stibal and Hiroyuki in 2010 and was an approved ThetaHealing Elective Seminar in 2011. Balance of $478.00 CAD due first day of class.